We are open Good Friday 19th & Saturday 20th. We are closed Sunday 21st & Easter Monday 22nd. tall growing, glossy green foliage, silver underneath. compact pyramidal growth, dark green foliage, white beneath; violet-purple cones. Eventually taller. Distinct spiny foliage. Popular in Victorian gardens. Native of Chile. Limited quantity. one of the most beautiful of conifers. Lovely glaucous blue spraying branches. Best as a specimen. the most graceful of Cedars, with drooping branches of soft green. 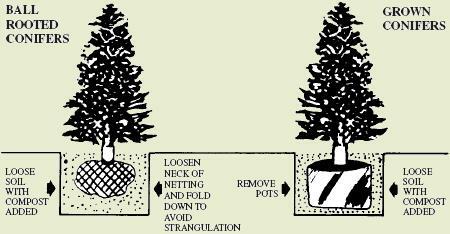 Quick growing and stands pruning. Best as a specimen. Larger sizes sometimes available on our retail sales area. a favourite hardy variety; smooth glaucous blue, with a narrow pyramidal habit. slender and upright. One of the best blue conifers. forms a perfect, dense spire of blue-green foliage. a very beautiful green form of narrow upright habit, similar to an Italian cypress, but much hardier. slower growing, bright gold, neat habit. upright smooth bronze golden foliage. fairly vigorous, bright gold, neat grower. an elegant, upright, very bright variety. Open form when young. Usually used for hedging, but planted singly or in clumps makes a fine specimen up to 30 metres. makes a fine golden specimen, slightly slower form. similar habit to Leylandii, but bronzy-gold foliage. large soft green fan-shaped foliage resembling a Maidenhair Fern; a pyramidal tree suited to smaller gardens. Deciduous. hardy, narrow, deep-blue. Effective as specimen plant. outstanding in its pillar-like growth and attractive blue-grey foliage. one of the most narrowly columnar trees, bright grey-blue. Effective as a specimen. the attractive fern-like foliage is deciduous and turns a tawny pink in autumn. Thrives in moist, and well-drained conditions. thrives in damp sites; fast growing. will grow in most soils. Bright green foliage. excellent windbreak, stands bleak exposure. extensively used for forestry purposes and thrives almost anywhere. blue-green soft needles. Quick growing. common on light healthy soils; grey-green foliage. bright green feathery foliage, turning red in autumn before falling. distinct small weeping elegant tree with tiers of horizontal branches, and small weeping branchlets. similar to above but silver-gold foliage. one of the best-known upright growing trees; slender when young, becoming broader with age. the golden form, otherwise similar to fastigiata; upright and broadly columnar. slow growing medium sized conical habit rich green colour. shining dark green aromatic foliage. Suitable for trimming. neat, bright green, pyramidal and narrow, suitable for tub work.